You’ll want your mime drama to be well lit, and this takes a bit of work. If your stage is too dim, the entire production will be diminished in its effectiveness. Variations in lighting can add greatly to a certain scene and the feeling that it conveys. There are many options to enhance lighting for the entire stage and individual scenes. These might include things like: used stage lights, flood lights from the hardware store, a floor lamp, or even an overhead projector. Used stage lights, called PAR Cans, work really well. You can buy the “flood” or “spot” type for about $50-$75 each and hang them wherever you want. You can also spend a lot more on really nice theater lights if you wish. Just be careful with any stage lighting that you buy. These lights range from 350 to 1000 watts each and will easily blow fuses if you have too many lights plugged into one circuit. They can get really hot, so keep them away from curtains and other flammable material. If you really want to have some fun with lighting, run extension cords from each light to one central power supply so one person can control all or several lights at one time. Hook up faders and click switches to the lights, and your light guy will be overjoyed! If you don’t have a big budget to work with, you’d be amazed at what you can do with some hardware store lights, a few extension cords and a power strip. Hand-held shop lights also work fine. They can be mounted on the wall or near the ceiling or even held by a person in the audience. If you have the time, build a light stand and hook up floodlights to each arm. Depending on what the scene demands, you can add color to your lights by securing “gels” in front of the lights you are using. Gels are commonly used with theater lights and are available at most music, theater or lighting supply stores. Variations in lighting can greatly enhance a clown / mime service. If you are using spotlights and faders, practice working the lights so that certain scenes are highlighted with lots of light while other scenes use only one spotlight in the dark. Lights placed low to the ground and pointing up to the characters can create some excellent shadows and be very powerful. A slide projector or overhead projector might be placed somewhere in the room to light a selected scene. Back lighting, which creates a silhouette, can be effective as well, but probably should not be overdone. At a camp, we asked all the kids to bring their flashlights and shine them on the clowns during certain scenes and the resulting effect was awesome! No matter how elaborate you get with lighting, remember, lights should enhance, not distract, from the message of the mime service. Just be creative in your use of lighting and remember to have fun! 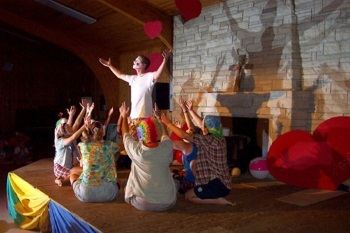 Mime Ministry: For more info about clown ministry go back to our mime ministry page.